You’d think the housing market is in fine shape, based on the sizzling optimism of the National Association of Home Builders, which just released its Housing Market Index. It rose to 55 in August – above 50 means more builders view conditions as good than poor – the third month in a row of gains, and the highest level since January. All three components of the HMI rose: current sales conditions to 58; future sales (that’s where hope thrives) to 65, the highest since August 2013; and traffic of prospective buyers (that’s where reality is nagging) to 42. OK, so foot traffic was crummy. But in the prior month, it was 39, even crummier. Yup, “affordable home prices” and “pent-up demand!” Not to mention “sustained job growth,” of jobs that pay enough to buy a home. Home builders have become an optimistic bunch in 2012. As housing starts were ticking up a smidgen, builder optimism as measured by the HMI began to surge, and except for a couple of dives, including during the harsh winter this year, has continued to surge. As the chart shows, the HMI (blue line, left scale) has soared even as the puny growth in housings starts (red line, right scale) petered out in 2013. And starts remain mired down at about one-third of the level where they’d been at the peak of the last housing bubble. But the NAHB’s electronic ink wasn’t even dry, so to speak, when the ever optimistic Fannie Mae, the bailed-out government mortgage giant, came out with its August 2014 forecast, in which it took a sledgehammer to its prior forecasts. Home sales have been plunging for months, after post-crisis optimism peaked mid last year. And Fannie Mae is belatedly adjusting to an ugly reality. It slashed its 2014 forecast for construction starts for single-family homes to 642,000 units, down 8% from its July forecast of 696,000. But it has been slashing its forecasts all along: in January, it had still seen 768,000 single-family housing starts for the year. And in August last year, it had forecast 876,000 starts for 2014. It has now chopped 27% off that forecast. Same thing with home sales. Fannie Mae cut its forecast for new single-family home sales to 431,000 units, down 11% from last month, down 21% from its forecast in January. August last year, it still believed that 588,000 new single-family homes could be sold in 2014. Now it has axed that by a brutal 36%. The current forecast is about flat with the 429,000 units actually sold last year. But this is only August. There are four more months to go, and at the current rate of slashing forecasts to bring them in line with reality, it doesn’t look good for the year. Fannie Mae then took its sledgehammer to its forecast of existing home sales. Only 4.91 million units will change hands this year, it said, down from 4.97 million in July, down from 5.18 million in January, and down from 5.26 million in August last year. The current forecast is already 3.5% below actual sales last year. And total home sales? Fannie cut its forecast for 2014 to 5.34 million units, from 5.45 million last month, from 5.70 million in January. The forecast is now down 9% from the 5.85 million it forecast in August 2013, and it’s 3.4% below last year’s actual sales. Construction is a large, labor-intensive contributor to GDP. That’s why construction bubbles goose jobs and GDP. And when they burst, they wreak havoc on the real economy, unlike financial bubbles. Existing home sales contribute less to the real economy, but are still important. And Fannie just shot down any remaining notion of housing being able to pull its own weight. 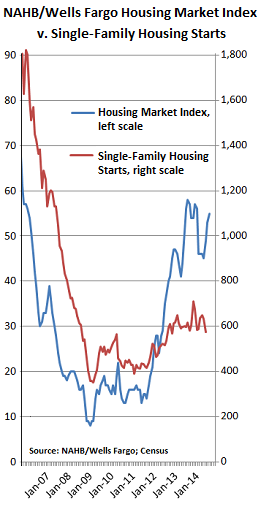 Despite the optimism of the home builders, housing is reverting to its status as being a drag. The housing market is not coming back anytime soon. People who lost their homes don’t have the credit or income to buy. Their children are leery of home ownership and saddled with student debt and no or low wage jobs. The money and demand doesn’t exist. All this info is by way of saying that she and her fiancé are not really contributing to the economy as much as they should be at their ages – no excess spending at all and no home spending and all related costs. Ditto with baby spending. We, the parents and his as well are spending some of our money on their essentials for them and worrying about their future. That means we are cutting WAY WAY back on all of our own frivolous spending and big spending as well. We put that beach house buy likely on permanent hold. Ditto with the twice yearly vacations. Ditto a new car. Ditto the remodeling of our basement into a family space. Do you thing the financial wizards running our economy into the ground can see the cascade effect of their avarice?? It seems not. No one is spending the amount needed to get the country going again because no one is secure enough or had enough income for either themselves OR are worried and assisting their loved ones. How stupid ARE these people? ?